Don was trying to make this fight into a party. And why not, right? Hey, they only had a few bats in Jetstone's battlespace, but this was gonna be the biggest flippin' battle since that volcano deal. You remember that one, dontcha? That's the battle that started Transylvito's whole cave-in. Oh yeah. And the idea that they didn't have a chip in this game was a laugh. A chip? Their whole stack was with the Wack from Faq. Her moonball keister was ridin' around on Transylvito's whole treasury. Not to mention the three cities and seven Warlords they were down since Don King put her on the throne. When this new heir popped, he wasn't gonna have much left to think about inheriting. But hey. Party time. Live it the flip up. 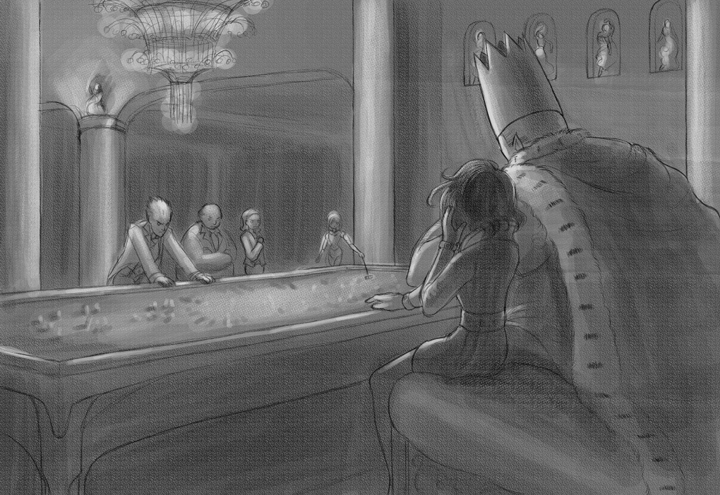 The palace war room was full of Skanks, a few Knights, and eight of their remaining nineteen Warlords. They stood around in itchy Class A formal raiment, sipping white wine in crystal stemware and eating greasy little meat pastries from silver trays. Don had a special perch above the action: the huge green felt tactical table with leather and brass fittings. He sat on a big cushion on a raised platform of brass and teak, with a mother-of-pearl inlay. Swanky. Bunny was up there with him, working, tuned in, directing the Dolls holding the croupier's rakes. Don's big fat flanks almost crowded her off the stand. Caesar ignored her completely, not even a glance. That's how they did this. She was in his head, but he kept his eyes off her. There was time for that later (though never enough). Instead, he had Dewy Tulips hanging on his arm, with Rosetta and Cheri shooting eye-daggers at her. He held his own little court by the bar. He didn't say any of the stuff he was thinking. He was just telling war stories, picked carefully from better wars than this one. His guys were laughing at his jokes. He was obeying the Royal order to have a fun time. Nobody was hanging with the King. As the head of Gobwin Knob's column pulled up to the bridge where Jetstone was making a stand, Don called the Warlords to gather round the table. They topped off their glasses and grabbed a few fistfuls of the remaining delicacies. Nobody was too serious at this point; it was gonna be at least a two-turn event, probably more. The stand would hold Gobwin Knob at the bridge to bring up their full column, which would let Jetstone's Princes fall back to the city, and the massive reserves from Haggar to move up. But an hour later? There were only five people in the room, all of them real sober. Fun time was over. This page was last edited on 13 April 2014, at 12:32.